In terms of packing a lot into a 5km run, it’s hard to beat this route around Muckross House & Abbey. As well as the House and Abbey, there are some truly spectacular lake and mountain views en route. The path follows the edge of the lake shore before heading inland to the splendour of Muckross House & Gardens. It is no wonder that this is one of the most popular parts of Killarney National Park. Experience some of the best of the Park and the magic of Muckross on this great 5km run. Muckross Abbey is situated 4 km south of Killarney town on the main N71 road towards Kenmare. There is a path for pedestrians, jaunting cars and bicycles that starts just on the outskirts of the town that will take you directly to Muckross Abbey and beyond. During the months of April to October, the local shuttle and ‘hop on, hop off’ buses will bring you to the starting point. If you are driving, there is a convenient car park close by. The car park is a traditional spot for the local jaunting cars to ply their trade during the summer season. It is from this car park that we will start and finish the run. Situated directly across the road from the car park is a gated entrance to Killarney National Park still known to some locals as the “new entrance”, despite being over 150 years old. As you go through the entrance, you may not notice the lovely gate lodge on your right hand side because you will be drawn to the view in front of you. Lough Leane is beautifully framed against the backdrop of the McGillycuddy Reeks. From the slightly elevated vantage of the path, you are treated to a spectacular view that never fails to inspire awe each time you visit. The main path continues and crosses over a bridge inscribed with “H.A.H.” – in memory of Henry Arthur Herbert who built Muckross House. You have an option here to remain on the paved path or venture closer to the lake shore on the lower path. The lakeshore trail is nice during the busy summer months but please note that after about 1 km it becomes a rough track peppered with tree roots and other bumps and holes so take care! With the lakeshore and the Reeks to your right, you may notice Muckross Abbey appearing on the left hand side up ahead. Stay right at the upcoming junction and head towards Muckross House. Continue on this path which naturally follows the shores of Lough Leane. During the summer time, this path to Muckross House can get quite busy so it might be an option to leave the path and follow the trail a little closer to the lake shore for this section of the run. If you are running along this trail, watch your step as the underlying limestone can makes the surface slippery in places. After some gentle rises and falls, the trail re-joins the main path as we approach Muckross House. Follow the path all the way up the long drive to the House. Torc Mountain and Muckross Lake will greet you to the right hand side but steer left along the edge of the House towards the main car park area. Soon the path descends again and you may need to put on the brakes as you gather speed before reaching the main N71 road at the Muckross Park hotel and the nearby Blue Pool Nature Trail. 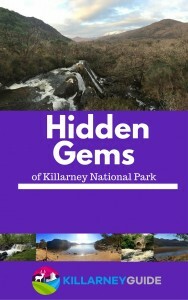 To get a FREE eBook on Killarney National Park and to get updates from Killarney Guide, please subscribe with your email below. As you exit the National Park, turn left and take another left turn almost immediately to re-enter the Park once more. You are now heading along the railed path that leads towards Muckross Abbey. This entrance to the National Park allows you to approach Muckross Abbey from a different angle. In the winter time, it’s a bit more sheltered, so if the wind is coming down from the mountains and across the lake, you’ll be spared some of its ferocity if you approach from here. You will see the Abbey coming into sight on your right hand side. Follow the path to the right (signposted ‘Killarney’) and you will soon be on familiar ground heading back to the starting point. The last kilometre of the route is retracing the path along the lakeshore to the Gate Lodge at the ‘New’ entrance. Watch out for that view again, this time on your left hand side. Check out some more of the other best 5k runs in Killarney here.